According to the CAA the European Commission has advised that, if the UK withdraws from EASA, any course completion certificates issued after 29th March by schools approved by the UK CAA will not be accepted by EASA Member States for licence or rating issue. Meaning, the CAA will no longer be able to grant European Part-FCL licences as they will no longer be a Competent Authority under the EU Regulations. Former Head of the UK CAA’s Licensing and Training Policy, Cliff Whittaker, characterises the implications of a possible “no deal Brexit” for student pilots, engineers and training organisations and action they can take. The CAA has said it will accept course completion certificates from ATOs for the new ‘UK-FCL’ licence, but that will have national privileges only. It follows that UK-based schools that intend to continue to offer Part-FCL courses, or complete those currently in progress, must apply to EASA for approval as a “third country ATO”. The CAA’s microsite reports that EASA is already accepting applications from UK ATOs. There is a particular problem here in respect of pilots who are currently training for licences and ratings who will not finish their courses until after 29th March. Some trainees on CPL courses will have started training before the referendum vote. Pilots already on courses will be expecting to get a Part-FCL CPL on graduation. The fact that they signed up for Part-FCL courses implies that they want European Part-FCL licences and will not be content to receive UK national licences. It is true that a pilot who is issued with a UK national licence could then apply to an EASA State for validation or conversion of their licence – but there are minimum experience requirements (flying hours as pilot in command) that newly qualified pilots may not be able to satisfy. And they would have to comply with the conversion requirements, including taking their theoretical knowledge exams again. The solution to this problem is for the ATOs to obtain replacement approvals from EASA with effect from 30th March 2019. Training schools that do decide to remain European by applying to EASA will need to ensure that all of their instructors (and the examiners whose services they use) have their certificates issued by other Member States, to safeguard the continuation of Part-FCL training and the interests of their students. Individuals who are training for Part-FCL licences or ratings and expect to gain their qualification after 29th March 2019 should read the preceding paragraph regarding training schools. Trainees who do require Part-FCL qualifications should ask their Head of Training whether the school is taking steps to ensure that it remains approved under European rules. Training organisations will know that flight simulators that are used for training and testing for Part-FCL licences and ratings must have approval certificates issued under European regulations. The notice from the Commission referred to at the start of this article does apply to simulator approvals issued by the UK CAA. If Brexit results in the UK leaving the EASA system, any simulator located in the UK used for Part-FCL training and testing will require a new approval certificate issued by EASA. Generally, all that I have written above about pilot licensing and training also applies to licensed engineers and Engineer training organisations. In the event of a “hard Brexit”, UK-issued Part-66 licences will become national licences and UK-based Engineering Training Organisations will no longer be approved to train individuals for Part-66 licences. However, the same options for preserving European privileges are available. Current holders of Part-66 licences can have their licences re-issued by other Member States before Brexit and Engineering Training Organisations can apply directly to EASA for approval to continue with Part-66 training courses. 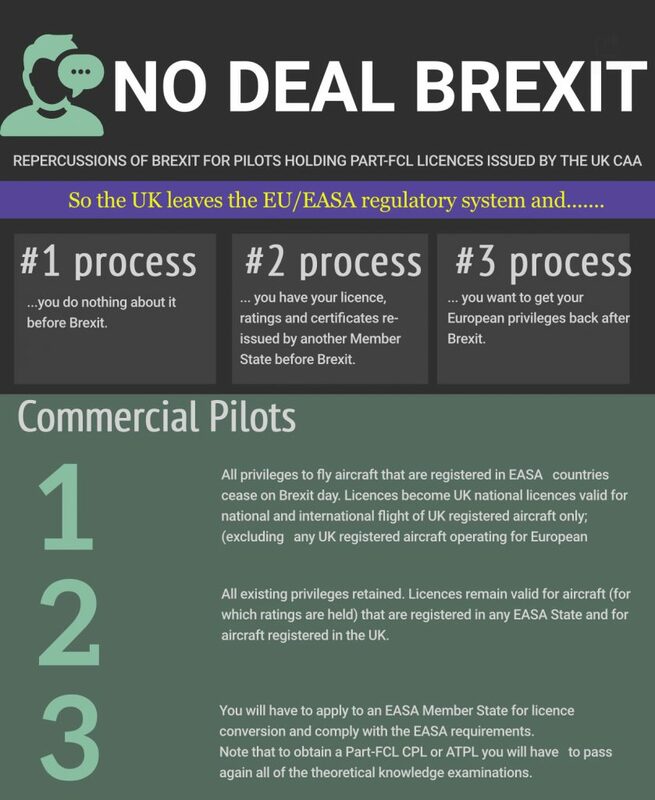 Having read all of this you may be thinking that, in the event of a ‘no deal’ Brexit, EASA and the Commission will probably produce some ‘special arrangements’ that are less onerous for UK pilots and organisations. However, any such arrangements cannot be an informal ‘gentleman’s agreement’. There would have to be a formal bilateral agreement between the UK and the EU defining what Member State Competent Authorities can accept from UK applicants for the issue of Part-FCL licences and ratings. • If a pilot with a UK national licence wants to fly an aircraft registered in the EU and asks EASA what he should do, the answer will be that he can obtain a validation or conversion from any Member State authority and the requirements are in the EASA Aircrew Regulation. • If an ATO asks EASA if Member States can accept their course completion certificates, the answer will be yes, if you get a 3rd country ATO approval from EASA. • If the DfT or CAA asks whether Europe can accept all licences, certificates and approvals issued by the CAA, the answer will be yes, if the UK signs an agreement with the EU to be bound by the European Aviation Regulations – as Norway, Switzerland, Iceland and Liechtenstein have. Given that those solutions already exist, why would EASA and the Commission invent something new for the UK? And how would they justify treating the UK more favourably than other 3rd countries – such as Turkey, a former JAA Member State? Remember – the option to have your licence issued by another Member State and so avoid the licence conversion requirements will end on the day the UK leaves the European aviation system – if that is a consequence of Brexit.